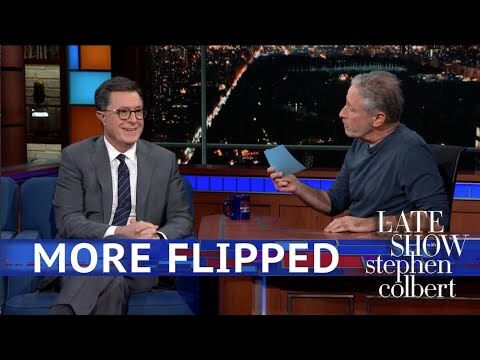 Jon Stewart asks Stephen Colbert about his transition to the Late Show, or how he went from being Stephen Colbert to being Stephen Colbert. Subscribe To The Late Show Channel HERE: http://bit.ly/ColbertYouTube For more content from The Late Show with Stephen Colbert, click HERE: http://bit.ly/1AKISnR Watch full episodes of The Late Show HERE: http://bit.ly/1Puei40 Like The Late Show on Facebook HERE: http://on.fb.me/1df139Y Follow The Late Show on Twitter HERE: http://bit.ly/1dMzZzG Follow The Late Show on Google+ HERE: http://bit.ly/1JlGgzw Follow The Late Show on Instagram HERE: http://bit.ly/29wfREj Follow The Late Show on Tumblr HERE: http://bit.ly/29DVvtR Watch The Late Show with Stephen Colbert weeknights at 11:35 PM ET/10:35 PM CT. Only on CBS. Get the CBS app for iPhone & iPad! Click HERE: http://bit.ly/12rLxge Get new episodes of shows you love across devices the next day, stream live TV, and watch full seasons of CBS fan favorites anytime, anywhere with CBS All Access. Try it free! http://bit.ly/1OQA29B --- The Late Show with Stephen Colbert is the premier late night talk show on CBS, airing at 11:35pm EST, streaming online via CBS All Access, and delivered to the International Space Station on a USB drive taped to a weather balloon. Every night, viewers can expect: Comedy, humor, funny moments, witty interviews, celebrities, famous people, movie stars, bits, humorous celebrities doing bits, funny celebs, big group photos of every star from Hollywood, even the reclusive ones, plus also jokes.